You just started a new business, which means you have goals that you want to accomplish. But we have one you probably haven’t considered. Make it a goal to create a content marketing strategy for your business. In this post, we’ll tell you why and how you can create your very own content marketing strategy. You’ll market more effectively and remove the guesswork from blogging. It’s a win-win. Let’s start at the beginning: defining content marketing. Content marketing is marketing that uses content to draw in customers. Rather than advertising or sales, content marketing actually makes readers want to visit your site. Done well, customers will actually seek you out for your content. One of the most popular methods of content marketing is blogging. But content marketing is by no means limited to blogging – eBooks, newsletters, social media, video, and more can all be part of a successful content marketing plan. So, if you run a blog with the goal of drawing in new customers, you’re already engaging in content marketing, whether you know it or not. Content marketing is a long game. Think about it – most content will still be bringing in traffic months, or even years, down the road. So the age old strategy of “throwing stuff at the wall and seeing what sticks” can be difficult to implement with content marketing’s long term timeline. You need a structured plan so that you can be more methodical in your approach. And I’m not alone in thinking this. 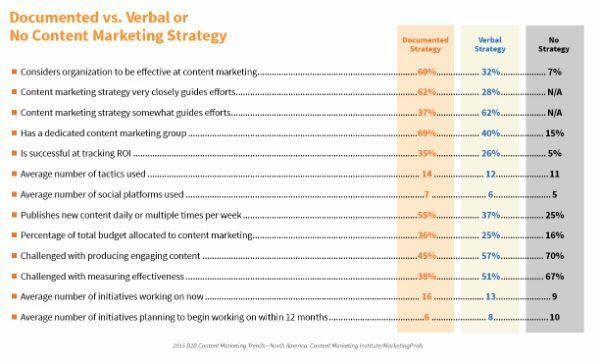 The Content Marketing Institute surveyed B2B content marketers and found that those who had a documented content marketing strategy considered their content efforts more successful than those who didn’t. As an added bonus, those with documented strategies also found it less challenging to create engaging content. So if you want to be more successful and less stressed, resolve to create a documented content marketing strategy this year. What do you want to get out of your content marketing? Are you looking to generate leads or email opt-ins? Or do you want to sell products directly? Needless to say, clearly understanding where you want to be is essential to actually getting there. Content marketing is a means to achieving specific business goals – don’t forget that. Some people even go as far as to create personas with real names. If you want to get truly personal, HubSpot’s Make My Persona tool can help you generate documentable audience personas. Next, you need to come up with the actual content that will interest your personas. Here’s where I see so many websites going wrong. Your content does not need to directly promote your product or service. Instead, your content needs to tie to your audience personas. It needs to be something that they are interested in. Once they’re on your site, you can slowly introduce them to your product or service. For example, if you sell resort vacations, you don’t need to write blog posts like “How to choose a resort vacation provider”. Instead, you can create content like “Top 7 Most Beautiful Island Resorts”. Those who are interested in island resorts may well be interested in a vacation provider sometime down the road. Awareness – your potential buyer recognizes they have a problem that needs to be solved…they just don’t know the solution yet. Consideration – your potential buyer researches all of the possible solutions to their problem. Decision – your potential buyer hopefully becomes your actual buyer when they make their decision. Try to create content that hits buyers at all stages. That way, you’ll be able to move them through from consideration to decision. Once you’ve brainstormed content that reaches your target audience personas and adheres to the buyer’s journey, you need to create an actual roadmap for how you’ll distribute your content. That’s your editorial calendar. Your editorial calendar takes the guesswork out of publishing. Instead of wondering, “which blog post should I write this week?” you’ll have everything mapped out in advance. At the end of this post, I’ll discuss some handy WordPress tools which can help you integrate your editorial calendar with WordPress. Content’s success is only as good as its promotion. You might have the best content out there, but if you’re not getting eyeballs on it, not many people will notice. To avoid that issue, you need to develop a solid content promotion strategy that you can apply to every post. Document this strategy in detail so that you can be consistent. Your content marketing strategy is only helpful if you’re able to actually implement it. These two WordPress plugins are designed to help you do just that. CoSchedule has built a successful business based solely on helping businesses and individuals implement their content marketing strategy. This tool helps you lay out content on a calendar. Then it takes it a step further by helping you promote your content with scheduled social sharing. Their WordPress plugin integrates directly with your dashboard so you can access everything without even leaving your site. 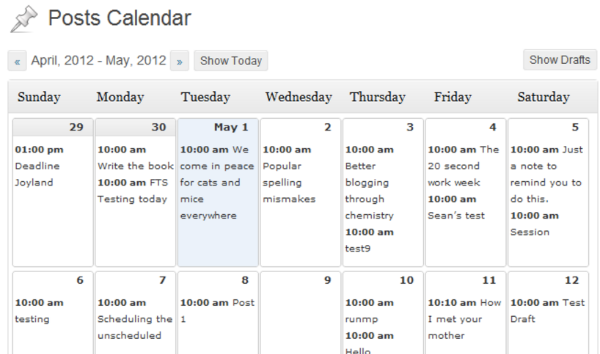 If you’re looking for a free, though less feature-rich, option Editorial Calendar is for you. Though it lacks the helpful social media promotion tools of CoSchedule, it still lets you schedule all of your content months in advance for smooth implementation of your content marketing strategy. Stop blindly feeling your way through the dark and switch on the flashlight that is a detailed content marketing strategy. It will take some time to sit down and document everything, but in the end, you’ll have a solid roadmap of where to take your website’s content in the future.